In short, iLASIK is an improved version of LASIK. In fact, iLASIK is considered a breakthrough in the refractive surgery industry. Comparatively, this new-generation, all-laser treatment produces exceptional results. The iLASIK Suite was developed by Abbott Medical Optics (AMO). Anyone who wants 24/7 visual freedom without glasses or contact lenses. So, how are these two treatments different? Also, what is the significance of a customized procedure? To illustrate, in a standard LASIK procedure, two people with the same degree of refractive errors (100 degrees of myopia for example) will receive the same correction from the laser. Conversely, two people with 100 degrees of myopia will receive different amount of correction from the iLASIK Wavefront Customize procedure. The advantages of the iLASIK Wavefront Customized Treatment? Already, LASIK is a safe, established, proven treatment. It is recognized as the gold standard in vision correction. iLASIK is a new and improved version of LASIK that makes use of innovative technology to further improve the surgery process and outcomes. In addition, the Wavefront Customized procedure offers completely individualized treatment. This allows for correction that is tailored to each unique eye, producing potentially better results. Hence, one could expect better results in terms of safety and accuracy. Due to its exceptional results, the iLASIK treatment is the only LASIK treatment procedure that NASA Astronauts and US Navy SEALs are currently allowed to undergo. iLASIK has less pain, lower downtime, and faster recovery times as compared to Epi-LASIK, LASEK and PRK. Generally, the MC given for iLASIK is 1-3 days, after which patients are free to return to daily activities such as work or school. Firstly, a high-definition 3D corneal map is generated using the iDesign machine. Wavefront-guided eye-mapping technology detects any microscopic differences or imperfections in each eye. Subsequently, the 3D map will be exported to the laser for use in surgery. Subsequently, a flap is created. Previously, surgeons would manually create the flap by hand using a microkeratome blade. Nowadays, advanced lasers are used for flap creation instead. Utilized in over eight million procedures and cited in hundreds of scientific articles, the IntraLase iFS Advanced Femtosecond Laser is a comprehensive platform built on IntraLase Technology’s legacy of surgical precision. As compared to older methods, the IntraLase iFS is able to create LASIK flaps more precisely, uniformly, and accurately. 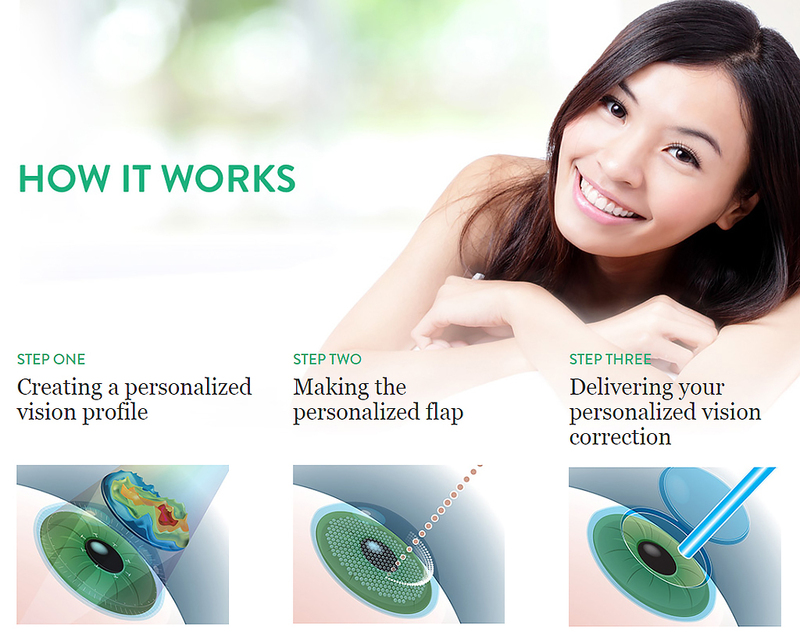 Iris Registration technology provides a noncontact, automated method to correctly align and center treatment. This allows for instant re-registration in the event of intraoperative movement. Variable Repetition Rate (VRR) delivers Fourier-reconstructed shapes with optimized ablation time. Also minimizes thermal impact on the cornea. Variable Spot Scanning (VSS) technology incorporates an array of varying laser pulse diameters. Itensures an accurate match between target and ablation shapes. ActiveTrak 3-D Active Eye Tracking technology follows the eyes motions in three dimensions. It can capture more than 99.4% of eye movements. ActiveTrak Automatic Centering technology locates and automatically sets the treatment center in relation to the pupil center. Evidently, every surgery has inherent risks. Hence, it is important to find a good surgeon. For more information about side effects, please click here. Established in 2007, Lee Hung Ming Eye Centre is one of the leading LASIK centres in Singapore. We strongly believe in continual improvement in terms of techniques and technology. As a result, we continually upgrade our centre with the latest LASIK methodology and machines. In addition, Lee Hung Ming Eye Centre is home to team of dedicated and experienced nurses, optometrists, and customer service executives. Furthermore, many of our staff have undergone LASIK surgery themselves. They will gladly share their experiences or answer any queries that you may have. MBBS (Spore), M.Med (Ophth), FRCS (Edinburgh), FAMS (Ophth). – More than 20 years experience. – 20,000+ LASIK & cataract procedures. – Experienced surgeon with excellent track record (as evidenced by his large number of referral cases). – Bladeless LASIK surgery (2004). – ICL surgery for the treatment of myopia (2005). – Laser-Assisted Bladeless Cataract surgery via Femtosecond Laser (2012). Furthermore, payment via interest-free installments is available. However,only DBS, POSB, and UOB credit cards can be used. The cost of LASIK may be lower than contact lenses in the long run. Consequently, you may save up to ~$28,980 on contact lenses after LASIK. LASIK is a lifestyle choice. Be free to do the things that you love.